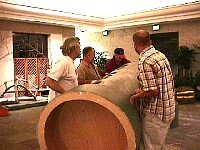 There are three pages of photographs from this event. 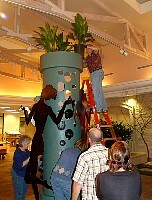 Photos taken by Rita Desilets and Ted Augustyn. 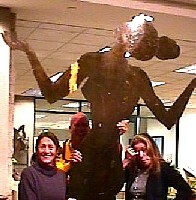 Click on the picture to see a large version of the photo. Use the links at the bottom of the page to navigate to the additional pages. 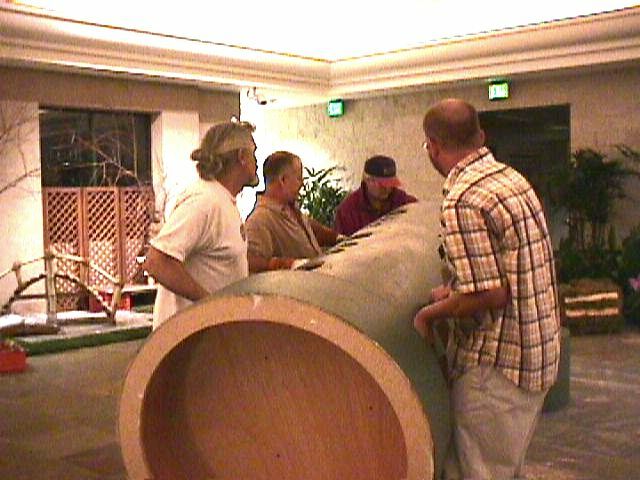 (l. to r.) Benny Lahav, Alberto Ossa, Harry Sinanian, and Michael Scarbrock place the (very heavy) central column into position. (l. to r.) Marissa Mitchell, Ted Augustyn, and Estee Magid dance with one of the three giant muses that will be incorporated into the display. 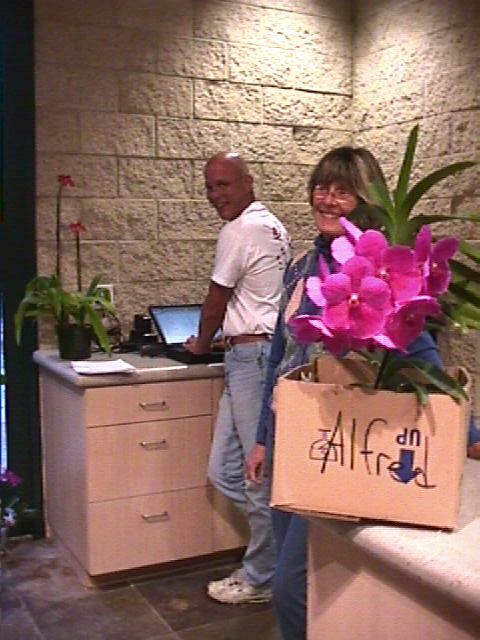 Krystine Chapparo (r.) helps Ted Augustyn process one of the 160 orchids that were entered into a database used to create the labels and submit plants for judging. 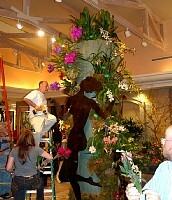 Harry Sinanian (top) starts placing decorative plants while the orchids are still being processed. Meanwhile, (l. to r.) Sandra Sinanian and Krystine Chapparo wire in plastic pots to hold orchids while Michael Scarbrock and Marissa Mitchell look on. Chief Display Architect Alberto Ossa adjusts the position of one of the orchids set into the central column to maximize its impact. Benny Lahav and Estee Magid offer assistance and positioning advice. Alberto Ossa gets out the electric screwdriver to help secure a hanging orchid in the display. 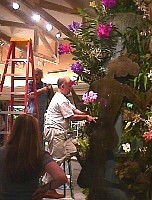 Estee Magic (l.) lends a critical eye while Michael Scarbrock (r.) stages the next orchid for inclusion in the display.